Taglines: Conquer him who is conquering me. Paz Vega replaced Jordana Brewster at the last minute. I love dark, twisted movies, and this is definitely right up there... an awesome thriller! All of the religious rituals are pretty disturbing (but incredibly fascinating). The idea these people really exist and actually practice these rituals freaked me out! All in all, I thought it was thought provoking, the performances were great, and the ending was entirely unexpected. I got the feeling there might be a sequel; if that's the case, I would definitely see it too. 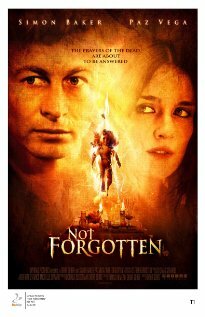 Long story short: If you're into thrillers with some brains, then you'll really like Not Forgotten.